We have to be back for the March parties! Kicking off soon-to-be Spring with legendary events at the Boatyard, Irish Night jubilantly returns to celebrate all things Irish! The Honorable John P. Barry presides over a delightful evening of lively Irish music and song, with highlights to include the infamous end-of-night conga line. Featuring the local Oyster Boys with Kevin Brooks, joined by talented guests Seamus Kennedy and Danny Costello and others. The MRE at the Boatyard - Up the Republic Night! 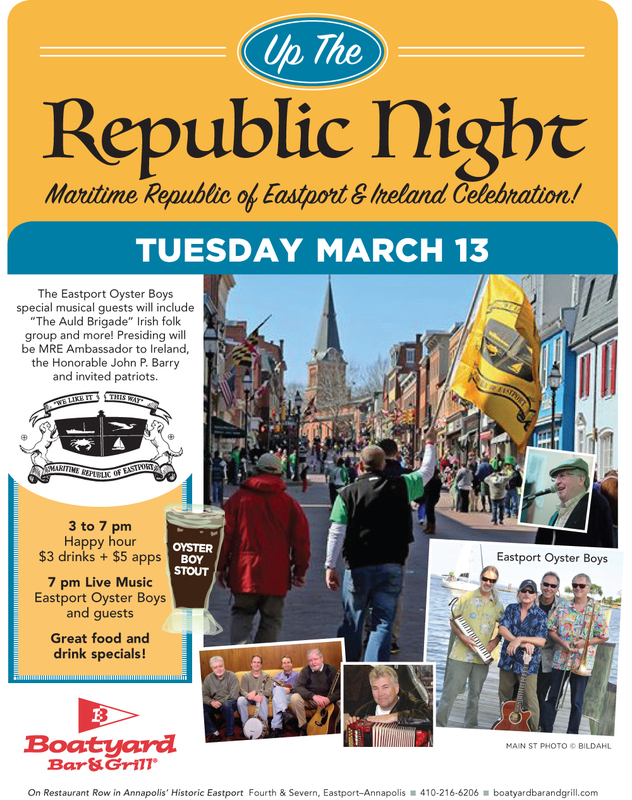 Celebrate all things Eastport and Irish. The Honorable John P. Barry, the Maritime Republic of Eastport's Ambassador to Ireland, presides over this lively evening, featuring Eastport's own Oyster Boys plus a very special musical guest line-up. Happy Hour from 3:00-7:00pm, band begins at 7:00pm.